China Admits That One-Fifth Of Its Farmland Is Contaminated : The Two-Way A government report says the land has been poisoned by heavy metals such as cadmium, nickel and arsenic, and concludes that the condition of China's soil offers "no optimism." 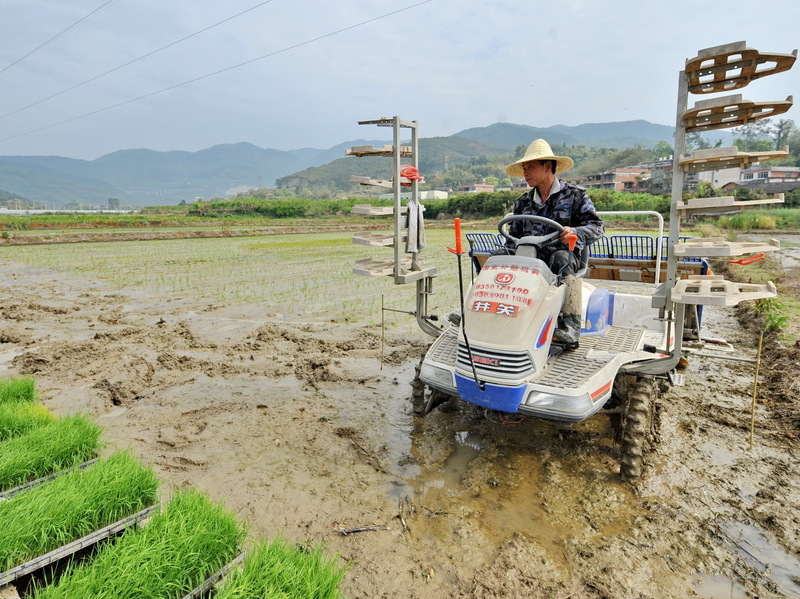 Xiang Zhengming plants rice seedlings in a field in southeast China's Fujian Province earlier this month. A newly released report says nearly 20 percent of the country's farmland is contaminated. Unbridled industrialization with almost no environmental regulation has resulted in the toxic contamination of one-fifth of China's farmland, the Communist Party has acknowledged for the first time. The report, issued by the ministries of Environmental Protection and Land and Resources, says 16.1 percent of the country's soil in general and 19.4 percent of its farmland is polluted with toxic heavy metals such as cadmium, nickel and arsenic. It was based on a soil survey of more than 2.4 million square miles of land across China, spanning a period from April 2005 until December 2013. It excluded special administrative regions Hong Kong and Macau. In a dire assessment, the report declares: "The overall condition of the Chinese soil allows no optimism." The Associated Press writes that the report was "previously deemed so sensitive [that] it was classified as a state secret." The official Xinhua news agency blames "irrigation by polluted water, the improper use of fertilizers and pesticides and the development of livestock breeding." Most of the contaminated farm land is on the highly developed and industrialized east coast, but heavy metal pollution was especially bad in the country's southwest, according to The Guardian. "In January, an agriculture official admitted that millions of hectares of farmland could be withdrawn from production because of severe pollution by heavy metals. And last December the vice minister of land and resources estimated that 3.3 million hectares of land is polluted, mostly in gain producing regions." According to the AP, the report "also points to health risks that, in the case of heavy metals, can take decades to emerge after the first exposure. Already, health advocates have identified several 'cancer villages' in China near factories suspected of polluting the environment where they say cancer rates are above the national average." As we've reported in the past, China's air pollution has become a real health concern in major urban areas.